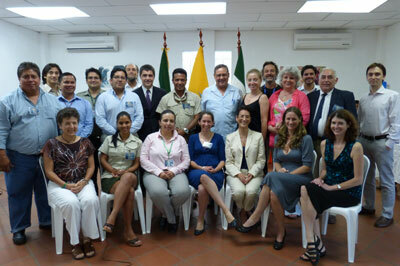 IAC Member Countries in the South Atlantic Celebrate Ten Years of Working Together to Protect Sea Turtles. 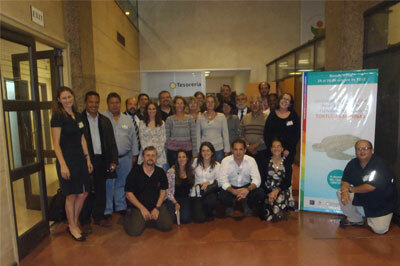 The VII Meeting and VI Conference for Sea Turtle Conservation and Research in the South Western Atlantic (ASO Turtle Network) was held from November 5-8 2013 in Piriapolis, Uruguay. The event was attended by more than 100 researchers and students from the three countries that form the ASO Network (Argentina, Brazil and Uruguay) and colleagues from other regions. The IAC Secretary was invited to give a presentation on the work of the IAC Scientific Committee and possible synergies with ASO. During the conference, presentations on rehabilitation, bycatch, biology and environmental education were shared. This meeting was a celebration of the tenth anniversary of the ASO Network and integration of the research and protection of sea turtles done by its members. We invite you to read about the activities and objectives of the ASO Network by visiting its Facebook. Workshop on designing a sea turtle conservation program at nesting beaches The IAC collaborated with the Department of Biodiversity of the Honduran Secretary of Natural Resources and Environment and, with the assistance of Didiher Chacon, IAC Scientific Committee delegate, held a workshop on September 9th in Tegucigalpa, Honduras. This event provided an important opportunity for all 22 participants to acquire a better understanding and exchange concerns and experiences on different topics related to the sea turtle’s life cycle, current status and threats as well as the how to design a monitoring program and its importance, including different types of methods used to monitor sea turtle nesting beaches (for example, different types of tags used). Individuals from different governmental sectors as well as academic institutions working in matters pertaining to sea turtle conservation in Honduras participated in this workshop. 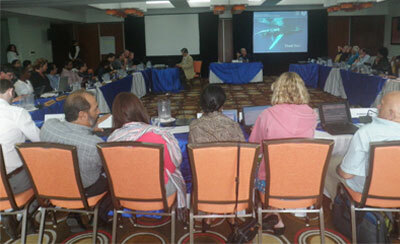 The 10th meeting of the Scientific Committee (SC10) was held from September 10-12, 2013 in Tegucigalpa, Honduras. During the meeting the Committee discussed topics such as adaptation of sea turtle habitats to climate change, sea turtle interactions with gillnet fisheries, the use of index beaches in IAC Annual Reports, technical collaboration within the framework of the IAC-Ramsar MoU, among other topics. The meeting report will be available shortly. 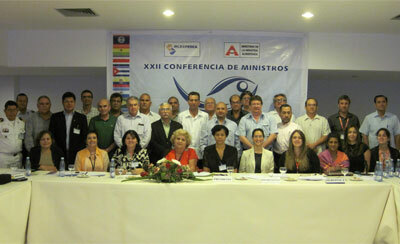 The 6th IAC Conference of the Parties (COP6) was held from June 26-28, 2013 in Galapagos, Ecuador. The event united scientific experts and representatives of 12 countries in the Americas and 10 observers to discuss and develop strategies to strengthen this important international collaboration mechanism to protect sea turtles. The Convention represents the commitment of its members to carry out common activities among nations to protect these migratory species and to guarantee a regional program to recover sea turtle populations. The topic of how to apply the current resolutions established by the Conventions 15 member countries was analyzed and the critical state and sharp decline of the Eastern Pacific leatherback population (Dermochelys coriacea) was discussed during this meeting. Other topics were also tackled such as fisheries impacts on sea turtle populations, solutions found by conservation projects to reduce this threat, egg consumption by traditional communities and the establishment of a permanent Secretariat for the IAC, among other topics. Celebrate World Sea Turtle Day – June 16th. The IAC would like to draw the attention of all countries in the region to take actions to raise awareness and celebrate these charismatic species during World Sea Turtle Day celebrated on June 16 in honor of Dr. Archie Carr, the “father" of sea turtles, who founded the Caribbean Conservation Corporation (now called the Sea Turtle Conservancy) in 1955 in order to conserve sea turtles nesting in Tortuguero, Costa Rica, which today is the longest running project in the western hemisphere. We would like to take this opportunity to thank all of those working towards sea turtle conservation and ask that you help us celebrate this day by organizing activities that create awareness and favor conserving this species. Climate change and sea turtles. The WWF expert Marianne Fish gave a webinar to the IAC Scientific and Consultative Committee members, which was held on March 18. 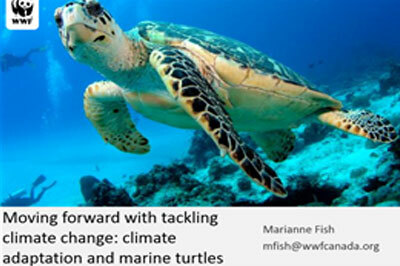 The objective of this webinar was to identify specific activities that can be carried out in collaboration with WWF to guide IAC Parties on how to improve their implementation of Resolution CIT-COP4-2009-R5: Adaptation of sea turtle habitats to climate change. Climate change and its effects on sea turtles is a highly complex issue and we greatly appreciate the collaboration of WWF and their willingness to share their expert knowledge on the topic and to continue working together with the IAC. Click here (Spanish only) to see the online webinar on climate change and sea turtles. Verónica Cáceres, IAC Pro Tempore Secretary met with Stetson University College of Law students on February 20 in Florida, USA, where she talked about the need for global collaboration and conservation. She discussed threats to sea turtles including incidental capture, habitat loss and climate change, emphasizing the need for international collaboration to protect the sea turtles that maintain healthy coral reefs and oceans and support the economies of nearby coastal communities. See article here. The 9th Meeting of the IAC Scientific Committee (SC9) . was held in Buenos Aires, Argentina from 24-26 October of 2012. The Scientific Committee presented results from the working groups on the analysis of the 2012 IAC Annual Reports, recommendations on exceptions presented and fisheries interactions with sea turtles. The meeting report will soon be available. The IAC is accepting nominations for the 9 sectorial representatives of the Consultative Committee of Experts. Three representatives will be selected from each sector: scientific community, private sector and non-governmental organizations. To request a nomination form please email contact@iacseaturtle.org. The deadline to submit nominations is December 20th 2012. The 9th Meeting of the IAC Scientific Committee (SC9) will be held in Buenos Aires, Argentina from 24-26 October of 2012. The Scientific Committee will present results from the working groups on the analysis of the 2012 IAC Annual Reports, recommendations on exceptions presented, report on fisheries interactions and collaboration with other organizations and address recommendations given by the 5th Consultative Committee meeting. See meeting documents here. IAC signs Memorandum of Understanding with Ramsar Convention. The IAC PT Secretariat is pleased to announce the signing of an MOU with the Convention on Wetlands (Ramsar, Iran, 1971). 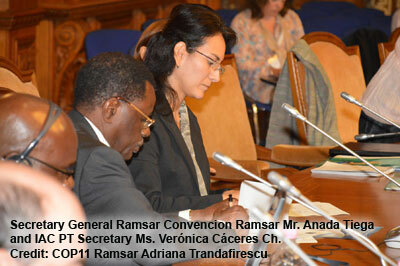 The signing was done at the Regional meeting of the Americas during Ramsar’s COP11 held in Bucarest, Romania on July 8 of 2012. The Ramsar Convention maintains a List of Wetlands of International Importance that includes a number of sites which are located in the Americas and are of great importance for sea turtles species. Therefore, through this MoU, we will work together for the wise use and conservation of wetlands, habitats that are vital for the nesting and foraging of sea turtles and to maintain the biodiversity and the health of wetlands. The joint activities to be undertaken in this new partnership with the Ramsar Convention includes among others the regular exchange of information on relevant activities and actions of the IAC and Ramsar Conventions, which are of mutual interest and benefit, to enable early detection of threats to sea turtles in Ramsar Sites and to facilitate the studies needed to identify measures for the mitigation of such threats. During the signing of the Memorandum Dr. Anada Tiega, Ramsar’s Secretary General, welcomed this cooperation that will significantly increase protection of coastal-marine habitats, the conservation of migratory species biodiversity and reiterated the importance that contracting parties of both conventions continue their efforts to implement on the ground wetlands conservation measures. Since 2011, Eco-Index of the Rainforest Alliance has provided a forum for quick and easy exchange of information on species conservation. 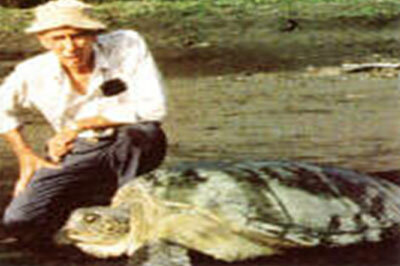 Furthermore, it promotes sea turtle conservation by distributing the work of the IAC. This month Rainforest Alliance interviewed Verónica Cáceres Ch, the IAC PT Secretary, who explains how this Convention is making a difference in sea turtle protection and conservation. Read more here. Venezuela joins IAC Celebrating World Sea Turtle Day On Monday June 4th, the Embassy of the Bolivarian Republic of Venezuela in Washington, DC and the Inter-American Convention for the Protection and Conservation of Sea Turtles (IAC), celebrated World Sea Turtle Day at the Embassy’s Bolivarian Hall with a panel discussion on joint efforts to preserve these endangered species. On the panel were IAC pro tempore Secretary Verónica Cáceres Chamorro, Earl Possardt of the U.S. Fish and Wildlife Service’s sea turtle program and Edis Solórzano, director for fauna at the Venezuelan Environment Ministry’s Office of Biological Diversity joined the panel via video conference from Caracas. They explained the achievements, programs and agreements signed through the IAC to preserve turtles and their habitats as well as the programs to preserve sea turtles developed in the Paria Peninsula and other coastal and island regions of Venezuela. Possardt highlighted interesting aspects of the biology and ecology of these migratory reptiles and how they connect all of us by visiting many countries in order to fulfill their life cycle. For example Eastern Pacific Leatherbacks nest in the beaches of Mexico and Costa Rica and migrate south to Peru and Chile to feed. Sea turtles connect countries and don’t understand about political boundaries. 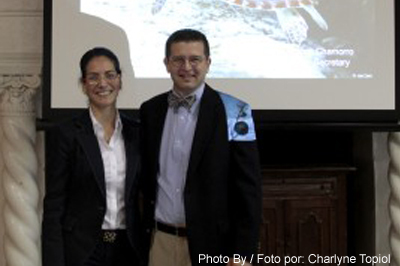 For her part, Solórzano said that Venezuela has a national conservation policy, which includes a program for the protection of the five species of sea turtles that exist in Venezuela. They do not do the work alone, the Environment Ministry develops projects jointly with local communities, NGOs and other governmental agencies. The Venezuelan official said that the program is not only aimed at preserving sea turtles, but also at supporting social projects in the communities. The IAC Secretary explained the achievements of the IAC member countries, including environmental education with communities, the adoption of new legislation to protect sea turtles in various countries, nesting beach monitoring, migration studies, bycatch mitigation and other efforts. The sea turtle day celebration was a success thanks to the generous support of the Venezuelan Embassy in Washington DC as well as the outreach materials and informative videos from Comision Nacional de Areas Protegidas - Mexico, Projeto TAMAR, WIDECAST, Humane Society International and US Fish and Wildlife Service. 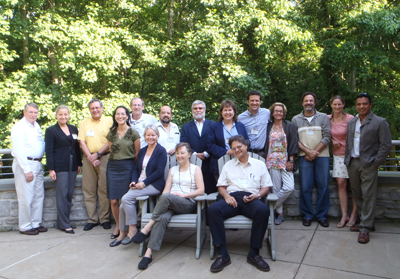 The 5th Meeting of the IAC Consultative Committee was held from May 30-June 1, in Sheperdstown, West Virginia. The committee reviewed IAC Annual Reports, discussed Eastern Pacific Leatherback conservation and prepared guidelines to sea turtle recovery actions. The final report will be available soon. The IAC Scientific Committee delegate from Panama, Mr. Marino Abrego, represented the IAC in the “Inter-regional Workshop on Long-term Marine Spatial Planning and Transborder Management of Marine Mammals” held from May 21-24 in Panama City. 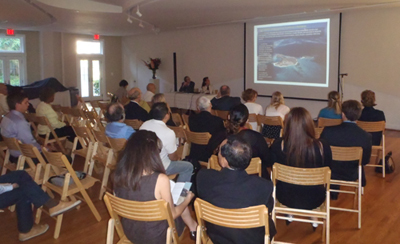 Delegates from 22 North American, Latin American and Caribbean Governments and 20 representatives of inter-governmental and non-governmental organizations and universities, as well as experts and scientists representing the region, shared and analyzed maps of the extensive migratory routes of cetaceans, their critical habitats and threats, priority actions were also discussed. The activity was held as a part of the LifeWeb Project of PNUMA/Government of Spain for the purpose of providing a general overview of the current situation of these habitats at a regional scale, as well as the migratory routs of marine mammals in the Eastern Pacific, Caribbean and neighboring regions, through regional training and exchanging experiences in marine planning; in addition to supporting PNUMA’s regional seas objectives under the Lima and Cartagena Conventions and their respective action plans on marine mammals. One of the topics discussed during the meeting was the need to include other migratory species like sea turtles and sharks in transborder management, since these species migrate between boarders of different nations and, furthermore, they are important to the local economy, play a significant ecological role and, as keystone species, have a large impact on the conservation of ecosystems in general. 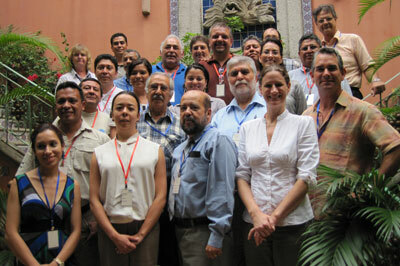 Latin American Organization for Fisheries Development (OLDEPESCA). The IAC PT Secretary gave a presentation in the XXII Conference of the Ministers of OLDEPESCA that was held May 17-18 in La Habana, Cuba. During the IAC presentation, the Secretary alerted the participants to the critical status of some species of sea turtles like the Eastern Pacific leatherback and the need to collaborate with the fisheries sector to work together on specific activities to help this population recover. She highlighted the importance of renewing cooperative efforts in topics of common interest, such as sustainable fisheries, biodiversity conservation and climate change. The IAC signed an MOU with OLDEPESCA in November of 2004. The 32nd International Sea Turtle Symposium was held from March 12-16, 2012 in Huatulco, Mexico, and focused on innovative aspects of sea turtle conservation: new techniques, new approaches and new actors, revisiting the objectives and conservation strategies that have been in place for decades, and go a step beyond the routine; its “Time for Innovation”! For more information. The XVIII Meeting of the Consultative Group and the Annual Conference of the Action Plan for the Protection of the Marine Environment and Costal Areas of the South East Pacific will be held from February 28 to March 1, 2012 in the city of Guayaquil, Ecuador. The CPPS sea turtle action plan will be reviewed during this meeting. For more information. The 8th Meeting of the IAC Scientific Committee was held from September 28-30, 2011 in San Jose, Costa Rica. See Final Report here. Argentina ratifies the IAC: We congratulate the Government of Argentina for their adhesion to the IAC on June 7 of 2011 and welcome them as the Convention’s 15th country. The IAC Conference of the Parties (COP5) was held from June 1-3, 2011 in Bonaire. See Final Report here. 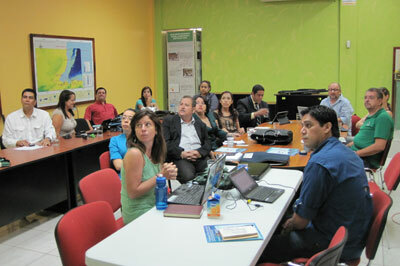 The IAC participated in the 2nd Meeting of the Caribbean Wetlands Initiative, organized by the Ramsar Convention, from July 4-9, 2011 in Bonaire. As a result, the participating Parties recommended that the two Conventions sign an MOU. The 31st Annual Symposium on Sea Turtle Biology & Conservation will be held from April 11-15, 2011 in San Diego, California. The symposium will highlight the next generation of research and conservation. Regional meetings will also be held prior to the main event. Visit http://iconferences.seaturtle.org/ for more information. The 4th Meeting of the IAC Consultative Committee of Experts will be held from March 22-24, 2011 in Brazil. Check back soon for more details.